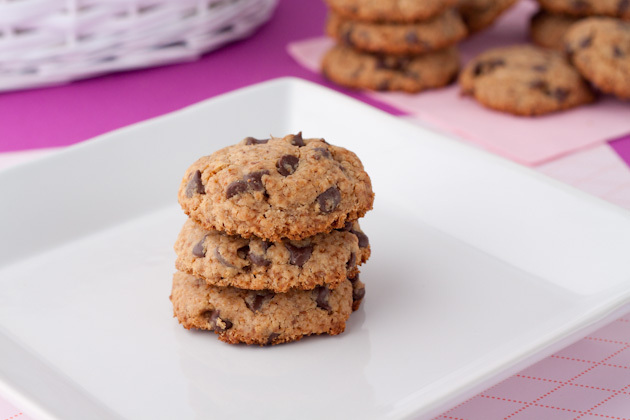 Gluten-free + Vegan carob chip cookies that are crunchy on the outside and chewy on the inside. Preheat your oven to 375F and line a cookie sheet with parchment paper or a silicon baking mat. Whisk the flour, salt and baking powder together. Set aside. Cream the coconut oil and sugar together by beating them until they are smooth in a stand mixer. If you don’t have a stand mixer, beat vigorously by hand in a large mixing bowl or combine them in a food processor. Add the date syrup, flax egg and vanilla and continue beating until well combined. Scrape down the bowl and gradually add the flour mix, beating just until combined. Stir in the chocolate chips with a spoon. 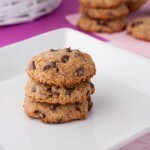 Using a spoon, scoop out a ball of the dough and drop onto the prepared cookie sheet. Flatten slightly. Repeat leaving 1 inch between the balls for the cookies to expand. Bake for 10-12 minutes or until cookies are golden around the edges. Allow to sit for two minutes on the cookie sheet then remove to a wire rack to cool fully.